September is World Animal Remembrance Month, a time for all of us to remember and honor the memory of our passed animal friends. As human beings, we have an obligation to respect and care for all animals on our planet; and as authors, we have the special ability to pay tribute to our furry (and sometimes not-so-furry) friends through the written word. Outskirts Press authors are a particularly animal-loving bunch, as demonstrated by two of our recent 1st-Place winners in the Colorado Independent Publishers Association EVVY Awards. Ellen Deery Freeman, author of 1st-Place EVVY Winner Just George, has rescued countless animals over the years, including a woodpecker, several mockingbirds, possum, and even a baby deer. As a retired science teacher, her classroom always housed live animals, including snakes. 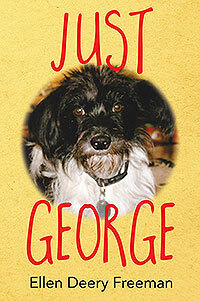 Just George is the true story of a injured dog Ellen and her husband, Buddy, rescued from the side of a highway and his struggles to overcome fears brought on by past abuse as he searches for his “forever home.” Ms. Freeman is donating 10% of the profit from Just George to the current management at Hampton County Animal Shelter in Varnville, South Carolina. Join us this coming Sunday on this blog as we interview Ms. Freeman. 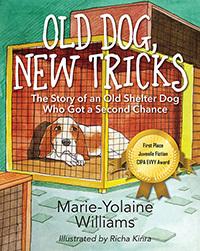 Marie-Yolaine Williams, author of 1st-Place Winner Old Dog, New Tricks, owns two senior dogs, Fenster and Keaton, both of whom were rescued. She wrote the Shelter Dog Series in hopes that it will encourage people to adopt dogs from shelters and consider dogs that are frequently overlooked by adopters. Join us as we interview Ms. Williams this coming Saturday on this blog. Encourage your parents to adopt a dog or a cat from a shelter instead of going to a breeder or a pet store. If your family decides to adopt a dog or a cat, consider an older “forever friend.” They make wonderful companions! If it’s not the right time to adopt, ask your parents to foster an animal. Fostering pets provides temporary homes for pets while they wait for permanent adoption, and that saves lives! There are other ways to help, too. Consider sponsoring a dog or cat that is in a shelter. Shelters need money for food, health care, and beds. Contact your local shelter and find out how you can help. Marie-Yolaine Williams is also donating a percentage of her royalties for Old Dog, New Tricks, in this case to Lifeline Animal Project and Susie’s Senior Dogs, an organization that provides exposure to older dogs in shelters looking for their forever homes. Join us tomorrow for a listing of the Top “Animal Remembrance” books from Outskirts Press in recognition of World Animal Remembrance Month in September. And join Ellen Deery Freeman, Marie-Yolaine Williams, and Outskirts Press in donating to the animal cause of your choice.